when i was young, i remember singing along to records on my record player. one day, on the radio, i heard someone say that a new kind of record player had been invented, one that used a laser instead of a needle. technology is constantly changing the background of our life. 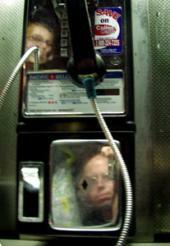 it won't be long before cell phones make the pay phone as rare as the long playing record. just as we see our reflection in a pay phone, we reflect on all the other objects of our past that we have forgotten or are soon to do so. i look forward to telling my kids "in my day, there used to be phones on the street corners and we used to have to put money in to make a phone call.